Posted on August 26, 2015, in AMC, Breaking Bad, Game of Thrones, IMDb, JP Kelly, Mad Men, Ratings, Royal Holloway, Social Media, Television, The Wire and tagged AMC, Breaking Bad, Fear the Walking Dead, Game of Thrones, IMDb, Ratings, The Wire, TV ratings. Bookmark the permalink. 9 Comments. Interesting, I personally have not seen the walking dead, only fear the walking dead, and I did review it on my page, but I think it is important to look at this new series on its own and not compare it to the walking dead as it is not the same show, what do you think? Hey iantow, I agree. But if anything, this series is worse if we judge it on its own merits (of which I can’t find many). Of course, this is just my opinion and I realise others will completely disagree – and are more than entitled to! I found this episode incredibly slow – painfully drawn out even. I honestly do hope it gets better and that my predictions about the longevity and quality of this series are off the mark! Indeed, It the first time I watched anything like it in this franchise, so I can’t compare, but I see what you mean there was a lot a dialogue and action, which is nice to see, but when you’re not familiar with the characters it does go on a bit. JP – The Walking Dead is still one of the top selling comic books out there. And the show is roughly following plot lines that are about 75 issues into the 140 plus issues already published of the book. The question Kirkman first sought to answer with the book is “What happens after the zombie movie ends?” An open ended premise that has proven filled with possibilities. A TV series is of course not a comic book, but the printed IP is extremely healthy and doesn’t seem to be running out of creative steam. If anything, it has pivoted into richer, more innovative directions. As far as FTWD, I was very pleased with the first episode. It is exploring a time period not touched by the original and features characters that don’t immediately come off as a clones of the original cast. There was a lot of table setting in the first episode, but as a fan of the books and the series I was more than glad to see those first days of the outbreak. I can’t speak to the metrics you are using, but from a creative standpoint, I think that there was a level of chaos and excitement that was intentionally left out from the first episode and will be built up to over the ensuing episodes of the show. It is almost impossible to replicate the sheer horror and adrenaline of Rick waking up alone in a zombie filled hospital. FTWD took a different path that might not have been as a viscerally exciting but that can still prove part of a winning formula. Hi Jorge, thanks for your feedback. Some really good points there. I must admit that I haven’t read the graphic novels so can’t comment on that. However, I do still feel that TWD is definitely running out of ideas. It feels very repetitive to me – but that’s just my opinion and I realise that many would disagree! Having said that, there have still been some excellent moments / storylines in the past couple of seasons. 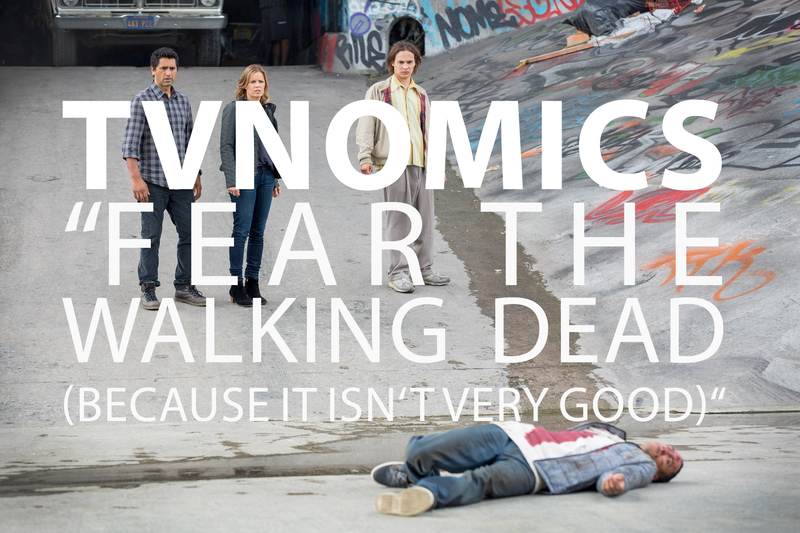 As for FTWD, I really do hope I’m wrong and that it picks up. I think I was just somewhat surprised at just how slow it was – but that raises some interesting questions. Perhaps the writers didn’t feel the need to do the usual pilot thing and have lots of “narrative pyrotechnics” (as Jason Mittell would call it). Perhaps they felt the guaranteed audience and backing of AMC would allow them to do something different, something slower. Having said all of that, I’m convinced that it still could have been much better. The Walking Dead does often feel repetitive. There are certain tropes and situations that have become part of the formula. In that respect, the comic book is much more innovative and fearless. I’m not giving anything away when I say that as the show pivots to more and more conflict between humans, the stories blossom and grow. A thinking, feeling, plotting nemesis is more sustainable for drama than walkers. BTW, I’m not sure if you know but Kirkman has another comic based TV show in the works. It is titled Outcast and is from Cinemax. It kind of does for exorcism what Walking Dead did for Zombies. And thanks for the heads-up about Kirkman’s other recent venture. I wasn’t aware of this but The Exorcist is an incredible film so you’ve set the bar high with your recommendation! I’ll definitely check it out.